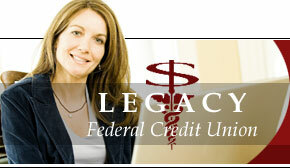 Access your account from your home computer with LegacyLink, our online home banking service. LegacyLink lets you connect with your money! Transfer funds between accounts, see what checks have cleared. Use the "Bill Pay" link and connect to our free on-line bill pay service. Pay all your bills from the security of your home computer. Just think, no more stamps to buy or envelopes to lick and nothing gets lost in the mail!